Abstract submission until February 28, 2017. Contemporary proposals to host the theatrical phenomenon, besides experimental or adapted spaces may also include iconic structures as a result from paradigms introduced in late capitalism. Projects designed since the late twentieth century obeyed these paradigms, including those theatres built inside cultural complexes. Architecture and theatre theorists extended the nature of the discussions to philosophers, sociologists and geographers. In parallel, Theatre Architecture has undergone numerous conceptual discussions that we aim to deepen at the Conference, the same occurring to Scenography as the stage became a space of relationships and juxtapositions, as the twenty-first-century world is no longer organised in sequential structures. We also aim to look at contemporary Performance Design and Space with the same approach developed in Prague Quadrennial 2015. 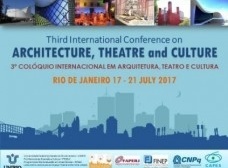 The Theatrical Space and Urban Memory Studies Laboratory and the Graduate Program on Performing Arts invite to the Third International Conference on Architecture, Theatre and Culture, to be held at UNIRIO from 17-21 July 2017. The Conference aims to propose to researchers and professionals from different cultural backgrounds a wide range of discussions and debates on three disciplinary axes focused on the performing arts: Theatre Architecture, Theatre (Scene, Performance, Performance Design) and Culture (basically grounded on Cultural History). It is expected that this third event will allow to continue the earlier discussions and translate the state of the art in the different fields that interfere and collaborate for the development of Processes and Methods for the Construction of Contemporary Scene, highlighting the great opportunity that this congress provides for the next generation of researchers and students of the three areas of knowledge, which will have the opportunity to interact with international and national researchers who will participate in this event. Alongside Lectures/Keynotes of well-known international scholars, there will be Round-Tables, Oral Presentations, and Banner Exhibition on the three focal subjects of the Conference (Theatre Architecture, Theatre and Cultural History). A Theatre Architecture Exhibition (models and drawings), Performances, Book Launch and Video Launch will be presented during the Conference. The paper should refer to one of the three axes of the Conference: Theatre Architecture, Theatre and Cultural History. Applicants should submit to the Scientific Committee a summary of about 500 words in English, or in Portuguese and English, or Spanish and English or in French and English, until February 28, 2017. The abstract must be structured in such a way as to present the theory and the methodology to be used in process of analysis of the object and may be theoretical or relating a case study. Note: Accepted abstracts will be published in a bilingual version in the Book of Abstracts.